I stay in a suburb that seems infested with poisonous snakes. 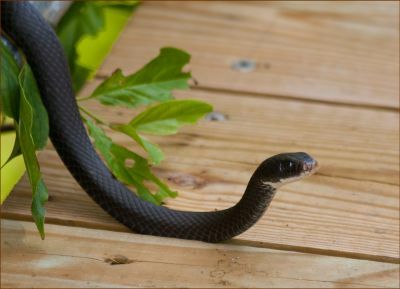 In my garden, I have encountered a viper and boomslang on two separate occasions. When I shared my predicament on Facebook, some users suggested that I kill these dangerous creatures – as a preemptive measure to protect my family and me. No doubt this was an attractive proposition, especially considering that some members of my household have a morbid fear of snakes. One evening we discussed this fear and myths about snakes. I was shocked when a university student who shares the house with us confessed to a fear of having a snake chase her around the house. We used the evening to allay such fears and demystify myths regarding the behaviour of snakes. Now allow me to link this incident with the protracted land debate currently taking place in South Africa. The link is purely for the analogous benefit and nothing more. Let me start by telling you how I handled this snake problem. I took the option of paying a snake catcher to safely remove and release the snakes elsewhere. I figured that snakes have as much right to live as I do. I also suspect that our suburb is built in a space that used to be their habitat. And if I am correct then the snakes are not the intruders – we are. But as humans, we can coexist with poisonous snakes – if we pay the price to find solutions to nagging problems and demystify persistent myths. As you would know, different types of snakes behave differently. And the same is also true of human beings. You can’t generalise and say that all whites in South Africa are against making concessions on land. Also, you can’t say that all blacks favour the wholesale expropriation of land. There are nuances in between. Therefore, progress is only possible when we remove the veil of ignorance. For instance, we can’t be blind to the fact that some politicians are not only leading this debate for egalitarian reasons – but also for political mileage. Personally, I am wary of the socialistic approach wherein the state should own all land – with citizens merely tenants. Most South Africans are paying less attention to this. Others are imagining a type of resettlement scheme where private homes will be expropriated and given to new owners. Now, let me share what I think will break the land impasse. For the last two years, my wife and I have been facilitating an empowerment project between an Eastern Cape farmer and his employees. The farmer bought more land to expand the farming operation with long-serving workers as the main shareholders and beneficiaries. Business plan and off-take agreements are in place for what would become a multimillion-rand project. We have now seen the project through tedious government bureaucracy to a place of implementation. I imagine that if there was an attempt to invade this particular farm, the workers would become a bulwark against such an action. They would want to protect what they own. What excites me about this project is its social improvement plan. It involves the creation of an NGO to oversee things like job creation, educational needs, healthcare, recreation, etc. There’s even talk of a pre-school and multipurpose centre for the community. So there is a multi-generational focus. My point is, for South Africa to work, we have to work together. There has to be compromise from all sides. In my case at home, I am not prepared to move out and make room for the snakes. But I am prepared to pay for them to be settled elsewhere. Notice that enmity between the snake and the woman is multi-generational, and that as long as this enmity exists, there will be bruising on both sides. Wow Afrika, great insight !! Love your voice of reason and exposing of motives. Holy Spirit teach us the road of complete reconciliation, keep our hearts soft & aware of the perspective of eternity ! May this generation shatter the lies and selfishness of the past ! These two verses come to mind ….